What state will you be participating in? Inspired by a stirring speech from Susan LaPierre, TWAW Shooting Chapters invites women across the country to head to a shooting range on Saturday, June 1st, 2019 for #NotMe Day to stand in solidarity with women self-protectors and show the world they refuse to be a victim or to say #NeverAgain to ever being a victim again. Each participant will fire three rounds to symbolize: I am empowered, I am prepared, I will not be a victim. “Women are tired of being the prey of violent criminals and are doing what it takes to protect themselves and their loved ones.” Shares Carrie Lightfoot, #NotMe Day Organizer and founder of The Well Armed Woman Shooting Chapters. “#NotMe Day is an opportunity for all women to join together and show the world that women refuse to be forever bound to the unequal battlefield of violence.” Lightfoot continued. 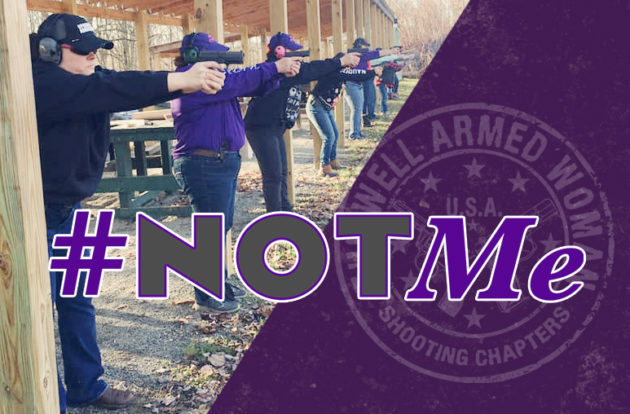 Women are encouraged to wear the color purple or the official #NotMe clothing from Nine Line Apparel and fire their symbolic rounds at any time during the day on June 1st. Participants are encouraged to share their photos on all social media platforms with the hashtag #NotMe and #NeverAgain if they have been victims of violence in the past. Although there is no fee to participate, a $10 donation is encouraged. The Well Armed Woman Shooting Chapters is a 501c3 organization is committed to providing women a comfortable and safe environment to learn and hone their firearm and self-protection skills.